THEKEY.TO is barely two years old, but already it's becoming one of Berlin Fashion Week's hottest tickets. Hosted by the German capital, home to a motley crew of artists, punks, and musicians, THEKEY.TO describes itself as the world's first international event for green fashion. 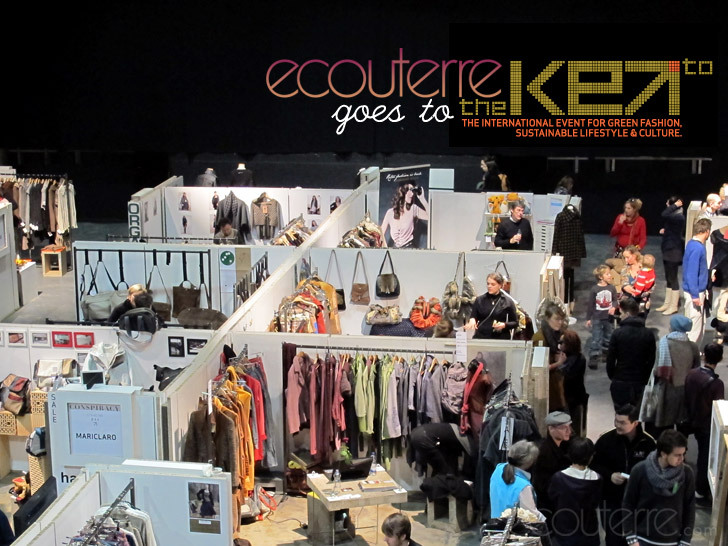 Ecouterre scoped out the fourth season of the three-day trade show (dubbed "Conspiracy"), which featured over 30 sustainable-fashion brands, a green catwalk, and guest speakers such as Source4Style's Summer Rayne Oakes. Here, we highlight some of our favorite finds, including labels you may be unacquainted with now, but will definitely see more of in the future. For its January 2011 season, THEKEY.TO experimented with a new venue—Columbiahalle in Tempelhof—to be close to Bread and Butter, the famous streetwear trade show. 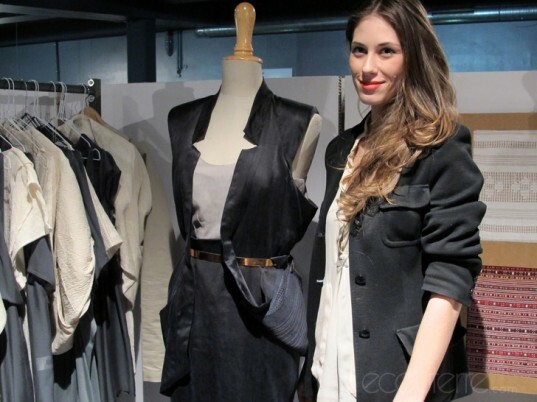 Featuring designers from 15 countries, the green-fashion fair took care to be sustainable in all aspects of its operation. Stands were made from recyclable cardboard, for instance, and upcycled Christmas trees provided the decoration. The show’s theme, “Conspiracy,” brought ethical-fashion insiders together to “conspire” as a collective to create global awareness. The show’s theme, “Conspiracy,” brought ethical-fashion insiders together to “conspire” as a collective to create global awareness. Much like London’s Estethica, THEKEY.TO has its own set of standards. Each brand has to adhere to strict guidelines, such as sustainable materials (organic, eco-friendly, recycled) and social standards (fair, social, craft.) In addition, there are optional supply-chain criteria that cover climate, toxicity, waste, and traceability. A recent graduate of Felicidad Duce in Barcelona, German designer Isabell de Hillerin is particularly inspired by traditional Romanian handicrafts and techniques. With so much fashion production moving out to Asia, the Romanian garment industry is nearly extinct. De Hillerin produces her high-end women's line in Romania, working with local artisans to create pieces that fuse traditional fabrics (including antique folkloric tablecloths) with modern design. Her work is currently on sale in Germany, Austria, and Japan. VITOR's third collection was heavily influenced by designer Vitor Bastos birth city of São Paulo, Brazil. Bastos, now based in Germany, focused on the "abrupt growth" of his hometown, that is, until then-mayor Gilberto Kassab banned billboards in 2007 under the "Clean City Law." Much like São Paulo, VITOR's line has been "built, rebuilt, and modified the same way," Bastos says. For Elementum, having less doesn't have to be boring. The Dutch label creates basic garments, designed to be the bones of your wardrobe, that can be worn in a number of different ways. Watch the video below for the countless variations its organic-cotton "Simple" collection affords. The space included a do-it-yourself area where visitors could participate in a host of activities, including knitting and lampshade-making. Berlin has a strong DIY community, as evident in Betahaus, an "open design city" that includes projects for adapting, modifying, and building upon. Other exhibitors included a mix of names familiar and new: the Emma Watson-endorsed People Tree, Berlin's own Slowmo, the gender-benders at MILCH, French textile-maker Yasmine Simon, Camilla Norrback from Stockholm, Rianne de Witte in the Netherlands, and eco-footwear brand Po-Zu. Planet-friendly fashion wasn't the only gospel THEKEY.TO sought to spread. It also introduced visitors to other aspects of the green lifestyle, with stalls that sold books and products about low-impact living. But Berlin isn't a city that only talks the talk. It's also home to a number of boutiques that are dedicated to eco-fashion, including Wertroll and Every Day is Sunday.